Our coordinators came this morning to check out the mold in our apartment, and 2 hours later, a cleaning guy came to get rid of the mold! Hallelujah! Such an unnecessary stressor. But now it is gone. Yay! I then booked my trip in Belgium!!! I will be flying into Brussels on Thursday, February 12th in the morning, then taking a free walking tour around the city. On Friday, I will be taking a day trip to Bruges and probably doing a pub crawl. Then on Saturday, I will be taking a chocolate tour around Brussels. I will be heading to London Saturday evening! I’m so excited! Today was a super exciting day! I got to see one of my best friends in the world! Shoshana and her boyfriend Allen were in town on Birthright, and had approximately an hour and a half of free time at the Shuk HaCarmel. Obviously, I had to see them. My amazing boss let me work from home so that I could take a lunch break in Tel Aviv and go see them! Shoshana and I hugged for a good minute. It was awesome. I showed them around the shuk for a bit, and they told me they hadn’t had “Aroma” yet. When Allen asked what Aroma was, Shoshana accurately described it as “Israeli Starbucks.” I bought the two of them icecaffes, a staple from Aroma, and we enjoyed them with little Hanukkah chocolates. We walked around the shuk for a little bit, as well as the surrounding streets. At the end of the shuk, there is a restaurant called “Grandma’s Kitchen” that has delicious Israeli food. We ate there and they caught me up on their trip so far. They are on an “Israel Outdoors” Birthright trip, meaning they are supposed to do a lot of hiking and other outdoor activities. Shoshana informed me that they have only done one hike so far, but were going to be hiking Masada the next morning. Their free time was winding down, so I took them back to their meeting spot and said goodbye with another tight hug for both of them. While it was sad to see them go, it was so amazing to have a piece of home come visit me in Tel Aviv! I returned back home to finish up my work for the day, and it started to pour. Very happy I was inside. However, seeing Shoshana and Allen was only the beginning of my reunions for the day. I was meeting with an old friend from my Milken days, Jillian! Jillian and I reconnected a few years ago, when Hallie became my little, because coincidentally, Jillian’s best friend is Hallie’s biological big sister! 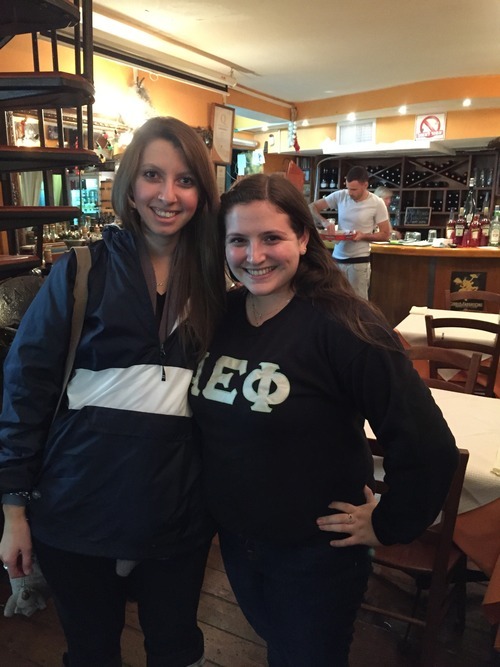 Jillian is also an AEPhi alum from Michigan, hence my letters for the photo! Hers were covered by her hair. We ate at an Italian restaurant called “Ernesto,” and it was pretty good! We sat and caught up with each other’s lives for a couple hours. Even though Jillian also lives in LA, the last time I saw her was when I was in London! Funny how things work out that, isn’t it? I went into the office today to find out that the other intern was sick again, so I had the office to myself. Yay! After work, Natalie surprised me by inviting me to her coworker’s Hanukkah party! It was a lot of fun and I FINALLY got to have latkes! And a lot of other good food as well. Unfortunately, our stay had to be short as we had an enrichment that evening. We were to hear the story of an Ethiopian Jewish immigrant. Sadly, we missed the first 45 minutes of his story, so by the time we got there, it was pretty hard to catch up. 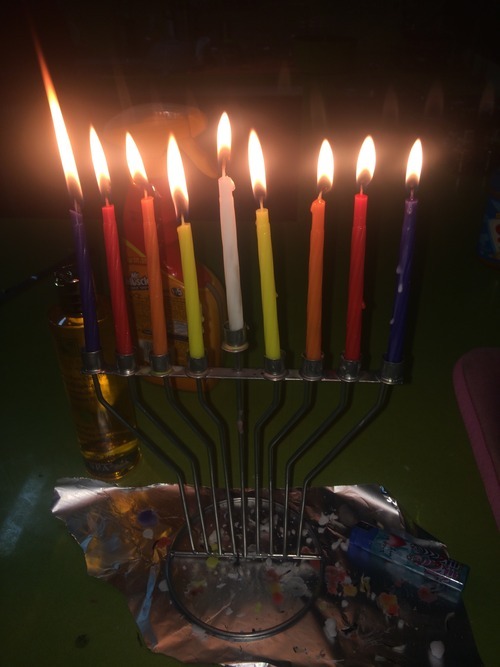 Yael and I took the bus home and she, her cousin Leah, and I lit the Hanukkiah for the last night of Hanukkah. Christmas Eve! I honestly wouldn’t have known that it was the day before Christmas in Israel if I didn’t have a Christmas tree in my apartment (or by looking at a calendar). Sadly, I woke up with yet another cold this morning. I loaded up on meds and headed to work. I had an interesting and good day at work today. I was only in the office for about 2 hours with my boss. I headed home for a few hours to work and rest, and then my boss and I met back up at a coffee shop near my apartment to work on a project. It was really nice to have a change of scenery. I think it really helped to get the creative juices flowing. After the coffee shop, I met up with Natalie, Daniel, Snir, and 2 of Natalie’s friends for a traditional Jewish Christmas Eve dinner: Asian food. Since none of us trust Chinese food in Israel, we went to get Thai food at “Beit Thailandi!” It was absolutely delicious, as per usual, and we all had a great time. I went home with a full belly, popped a nighttime cold pill, and drifted to sleep. Overall, a very fun week! Aside from getting sick, that is. But I got a very special gift for Christmas, which I can’t wait to tell you all about!